According to multiple outlets, the highly anticipated light heavyweight title scrap between champion Mauricio “Shogun” Rua and Rashad Evans will headline a yet-to-be announced UFC 129 event on March 19th. The show is expected to take place inside the Prudential Center in Newark, New Jersey. Although UFC president Dana White had previously confirmed the matchup many moons ago, Sportsnet.ca was the first to discover the when and the where. They also reported a 205-pound affair between Tito Ortiz and Antonio Rogerio Nogueira is expected to appear in the pay-per-view broadcast. 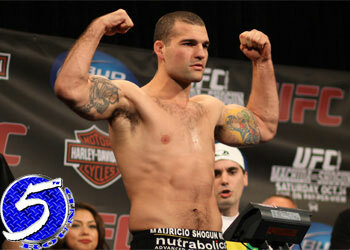 Shogun captured the crown in his last Octagon outting at UFC 113. He’s been firing blanks since putting Lyoto Machida to sleep in May courtesy of a third knee surgery. If reports holds true and the Brazilian is able to answer the bell, it will mark the first time the light heavyweight belt will be defended in the last 10 months. Evans owns an impressive 15-1-1 professional record and was last seen handing Quinton “Rampage” Jackson an uneventful loss at UFC 114. It was his second straight win, both by way of unanimous decision. Prior to his current streak, the former light heavyweight champ lost his strap to Machida after getting slapped silly at UFC 98.